﻿Main > North > Chiang Mai > Chiang Dao > Muang Ngai > Buddhist pagoda of King Naresuan the Great King Me.. Located in Bann Meaung Rhai, Chiang Dao. People have come together to create a memorial that he had come to visit. Before go to the battle field to the city of Myanmar Angwa. The eight-sided pagoda. 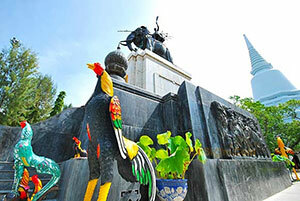 At the base of the statue of King Naresuan picture. The stone is inscribed on each side of the story of his royal duties. Switch on the marble slab with his Biography. History of the pagoda. It's a replica of the statue in the shrine of King Naresuan. King A-katodsaros and Princess Supan-Kalaya.